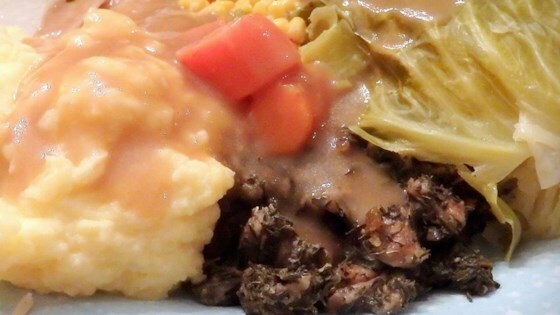 "A traditional Newfoundland meal, comparable to Corned beef and cabbage. Newfoundland is Canada's easternmost province, and is an island in the Atlantic. Make sure that the split peas are securely tied into a cloth bag (pudding bag), a dish towel or cheesecloth, if they escape you will not have a dinner, you will have pea soup!!" Cover the corned beef with cold water and soak overnight in the refrigerator. Drain the beef and place in a large Dutch oven. Cover with fresh water. Place the yellow peas in a triple layer of cheesecloth and tie securely. Place the bag inside the Dutch oven with the beef. Bring to a boil, then reduce to a simmer and cook for 2 hours. After 2 hours, add the chopped cabbage, turnip, and carrots to the pot. Simmer for 25 minutes. Add the chopped potatoes and simmer an additional 20 to 25 minutes, or until all of the vegetables are fork tender. While the vegetables are cooking, prepare the dumpling dough as follows: Combine the flour, sugar, and baking powder in a bowl, then add the water a little bit at a time to make a pasty dough. You may not need to add all of the water. Divide the dough into 6 balls. Be careful not to over-handle the dough. During the last 5 to 10 minutes of simmering the vegetables, place the dough balls on top of the vegetables and cover with a lid. Allow the dumplings to steam in the pot for 7 minutes. When the dumplings are cooked through, remove all ingredients from the pot and arrange on a warm serving platter. Remove the cooked peas from the cheesecloth bag and mash with the butter and black pepper. Serve alongside the beef and vegetables. Nothing makes a dinner party more inviting than satisfying comfort food. didn't care for this at all. My husbands from Newfoundland and we absolutely love this dinner!!! We have it every Sunday.